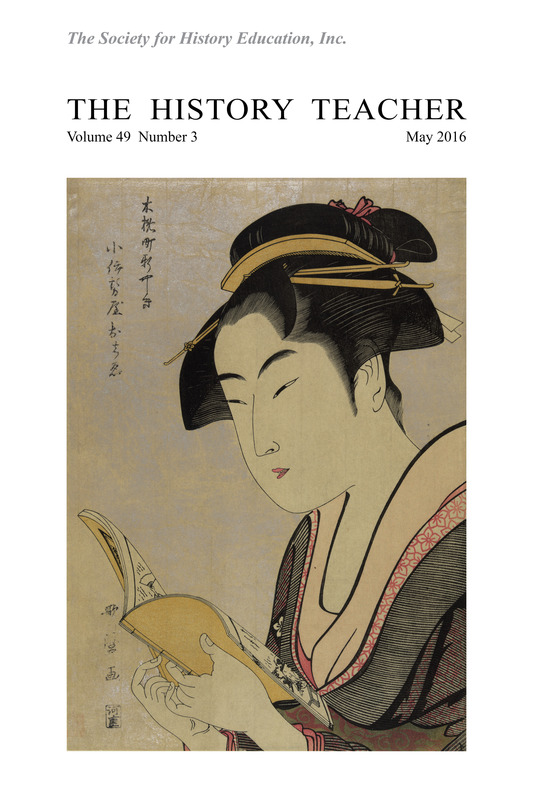 May 2016 Front Cover: Kobikichō arayashiki koiseya ochie (Ochie of the Ko-ise-ya of the Arayashiki in Kobikichō). Woodcut by Kitagawa Utamaro, Japan, ca. 1780-1789. Library of Congress, Prints and Photographs Division, LC-DIG-jpd-02053. Back Cover: Hikeyotsu no yoru no ame (Night rain at 10 pm). Woodcut by Kikukawa Eizan, Japan, ca. 1818-1820. Library of Congress, Prints and Photographs Division, LC-DIG-ppmsca-18405. 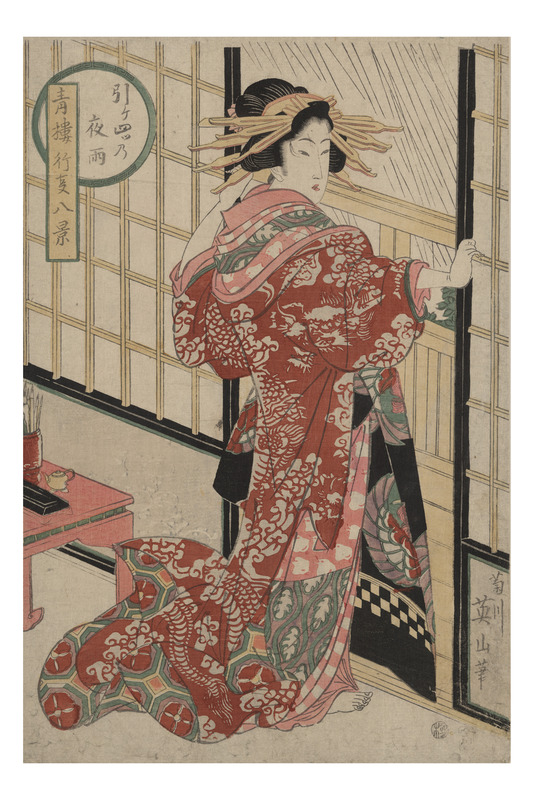 These beautiful cover images are among the hundreds of Japanese woodcut prints, or ukiyo-e, offered in high definition by the U.S. Library of Congress Prints and Photographs Online Catalog (PPOC). The mass-produced ukiyo-e allowed Japanese art, culture, and history to reach wide audiences, in terms of both economic status and geographic distance. Sean P. McManamon uses ukiyo-e to engage students with various aspects of Japanese society, particularly during the transition from the pre-modern to the modern era, in "Japanese Woodblock Prints as a Lens and a Mirror for Modernity," which begins on page 443.
by James E. Seelye, Jr.
Nicholas Buchanan holds a Ph.D. in History and Anthropology of Science and Technology from the Massachusetts Institute of Technology. He is a Visiting Assistant Professor in the University of Minnesota Program in History of Science and Technology, where he teaches courses on the history of technology, ethics in science and technology, environmental studies, and, of course, science fiction. His current research focuses on the history of artificial environments (ranging from aquaria to spacecraft), and how these technologies helped scientists, policy makers, and the public understand the human place in nature. Tina M. Ellsworth is a Ph.D. candidate in Curriculum and Instruction with an emphasis in Social Studies Education at the University of Kansas. Previously, she taught secondary social studies in Missouri. Her research interests include beginning teachers' conceptualization of history, the professionalization of beginning teachers, and the instructional use of social media. Duane Fleck is an Ed.D. student at the University of Kansas. In addition to his own studies in education, he is a U.S. history teacher at Lee's Summit High School in Lee's Summit, Missouri. Nora E. Jaffary did her doctoral degree at Columbia University. She is an Associate Professor in the Department of History at Concordia University in Montr�al and served as Department Chair from 2013 to 2016. Her research focuses on colonial and nineteenth-century Mexican History; she is finalizing a book manuscript entitled Reproduction and Its Discontents: Childbirth and Contraception in Mexico, 1750-1905. Loretta E. Kim is an Assistant Professor and Coordinator of the China Studies Program at the School of Modern Languages and Cultures, University of Hong Kong. She is a historian of late imperial and modern China. Her primary research areas include the comparative history of borderlands and frontiers and Chinese ethnic minority languages and literatures. Loretta has fostered innovation in tertiary-level history education in Hong Kong by promoting digital humanities methodology and student-centered learning. Joseph Marangell earned his Sixth Year Professional Diploma in Educational Leadership from Southern Connecticut State University. He is currently the Social Studies Instructional Leader for Grades 6-12 in East Haven, Connecticut. Joe actively works with faculty to embed literacy instruction in their content area classes. Sean P. McManamon is a social studies teacher at Brooklyn Technical High School. He received his M.A. in History from Hunter College in New York City. He currently teaches Advanced Placement World History. His research has been published in the Journal of the Westport Historical Society (Cathair na Mart) in Ireland. He is currently working on an article about Bangladeshi Independence in 1971. Joseph O'Brien is an Associate Professor in Middle/Secondary Social Studies Education at the University of Kansas. He earned an Ed.D. at the University of Virginia, was on the faculty at Virginia Commonwealth University, and taught social studies in grades 7-12. His research interests include the instructional use of social media and history teachers� use of primary sources. R�gine Randall earned her Ph.D. in Curriculum and Instruction at the University of Connecticut. She is a certified reading consultant and has worked extensively in secondary classrooms to support content area reading and writing practices as well as disciplinary literacy. Currently, R�gine is Coordinator of Graduate Reading at Southern Connecticut State University. Eugene S. Tam earned his M.A. in Linguistics from the University of Hong Kong, and a B.A. in English and a B.Ed. in English Language Teaching from Hong Kong Baptist University. His research interests are socio-semiotics and sociolinguistics.